Add caster and camber adjustability, and fix alignment issues on your lowered S550 Mustang with Caster/Camber Plates from BMR Suspension. The factory alignment adjustability can be insufficient when you lower your 2015-newer Mustang. Manufactured from CNC, laser-cut steel plate, BMR’s CP001 Caster/Camber Plates are designed to add caster and camber adjustability to the S550 front suspension. BMR also replaces the weak factory strut mount bushing with high-quality US-made, Teflon-lined spherical bearings. This allows you to correct the alignment on lowered S550s and add aggressive alignment setting for racing applications. 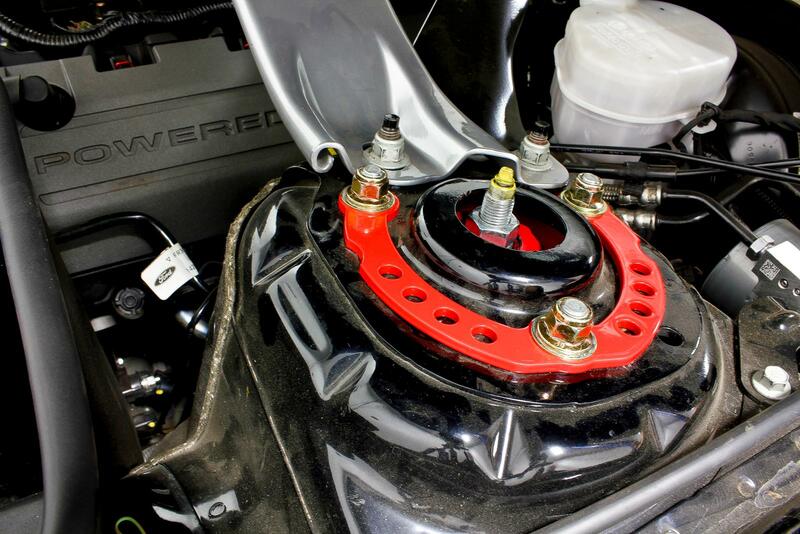 BMR’s CP001 Caster/Camber Plates replace the factory upper strut mounts. The design increases the camber adjustability and adds caster adjustability that isn’t available from the factory. These adjustments also help reduce unwanted tire wear from too much negative camber. 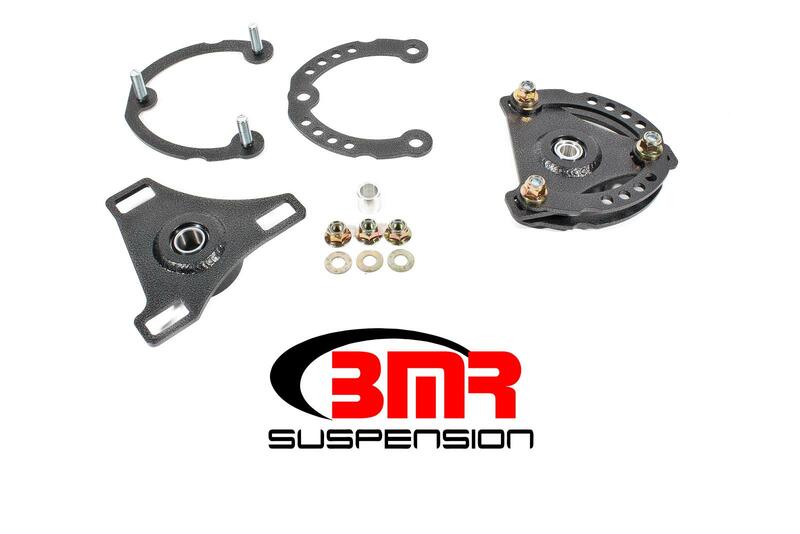 BMR Suspension designed the CP001 Caster/Camber Plates for street performance, drag race, and handling application. This 100% bolt-on kit uses existing boltholes and supplied hardware, allowing for easy installation. Once installed, the Caster/Camber Plates give you a total camber range of 1.75 degrees. This allows you to correct the alignment on lowered Mustangs. BMR’s Caster/Camber Plates also give you the ability to add aggressive alignment settings for both the street and the track. This helps to keep the largest possible tire contact patch for autocross and road race applications. 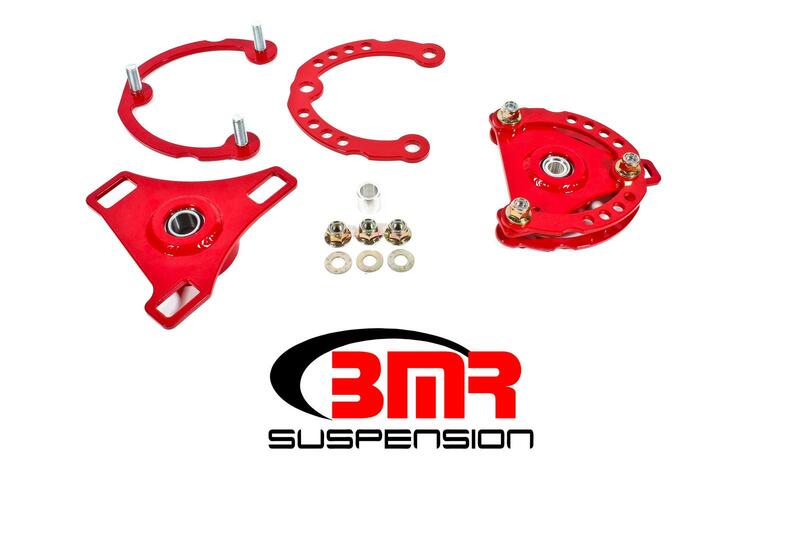 BMR Suspension’s CP001 Caster/Camber Plates are available in black hammertone and red powdercoat for long-lasting good looks. Installation time is about 2 hours. Proudly made in the U.S.A.!